It's All the Rage on the Road This Week! It's been a mad week of driving lessons in Nottingham. I reckon the sudden traffic build up after the school holidays combined with the rise in temperature has caused tempers to fray out there on the road. I have experienced three separate incidents of direct horn blaring and gesturing from psycho types with my pupil having done absolutely nothing wrong. The L plate has been like a red rag to a bull. Picture this. We're turning right on a tight road with parked cars. Not much traffic on it at the time. Pupil taking it steady and checks the bus up ahead isn't moving off. Massive blare of a horn and a mad guy giving it fingers and shaking his fist. My pupil looks worried as he screeches past and then pulls up on the right 20 yards ahead and gets out. His journey complete. As we drive passed he's yelling and waving his arms about before going into his house. We would have delayed him by about three seconds. In the second adventure with a different pupil we're emerging left on to a busy road. Naturally we're waiting for a proper gap instead of chancing it. Uphill as well so the move off will be slower. Blare of horn and young guy giving fingers and waving his fist about in the car behind. I turn in my seat and look at him. Now people don't realise that driving instructors do actually use the mirrors and will see what they are doing. The look of shock when you turn round is quite satisfying. the guy starts looking down and messing with the stereo. He follows us closely after emerging behind us then screeches past. Goodbye sir. The third one was a bit scary actually. Pupil number three is picking his way down a crowded street until we get to the give way line at the crossroads. Blare of horn. A guy in a dark Bentley is giving it hand movements. I notice he then calms down and starts pointing straight at me in a menacing fashion. I don't turn around, I see him in the mirror. He looks like a guy who might get out and kill me. We move off first opportunity. In all of these incidents we had done nothing wrong except being a bit on the slow side. This was just bullying plain and simple. I hope this isn't going to carry on and become the norm. As instructors we have every right to be out there going about our lawful business without being targets for other nasty types to let off steam. All we can do is be professional about it. There's no choice anyway when you've got your name on your car and people can find you. Stay safe. 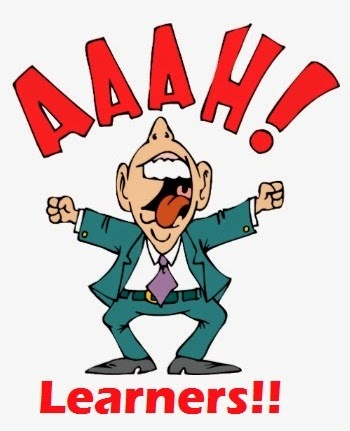 Do Pupils Care What Grade Their Driving Instructor Is? With the introduction of the new standards check for driving instructors and a simpler grading system it is hoped by some that those who achieve a top grade will be better positioned in the market place when selling driving lessons. I have found that grades and further qualifications do little or nothing to promote an instructor above those with lower grades and no further qualifications whatsoever. The old 1 - 6 grading system was no use at all in distinguishing a driving instructor in the eyes of the public owing to the number given to the top grade. The number 6 is actually quite a bad number for this purpose. Grade 1 is understood to be a top grade universally and on a scale of 1 to 10 a 6 is neither here nor there. No point promoting yourself as a grade 6 instructor if nobody except industry insiders know what it means. Now we have grades A, B and fail. A little more sensible it seems. A is generally accepted as a top grade for most things. On the other hand a grade B is still perceived by the public as being pretty good. if an instructor just manages to scrape through the Standards Check they will still look OK to the public who may assume that grades C and D exist as well. Many people pass school exams with a grade B and regard this as a success. An instructor who misses an A by one point will have the same grade as someone who just managed to pass even though there is a significant difference in the scores. The main problem is that the public just don't seem to care about grades. 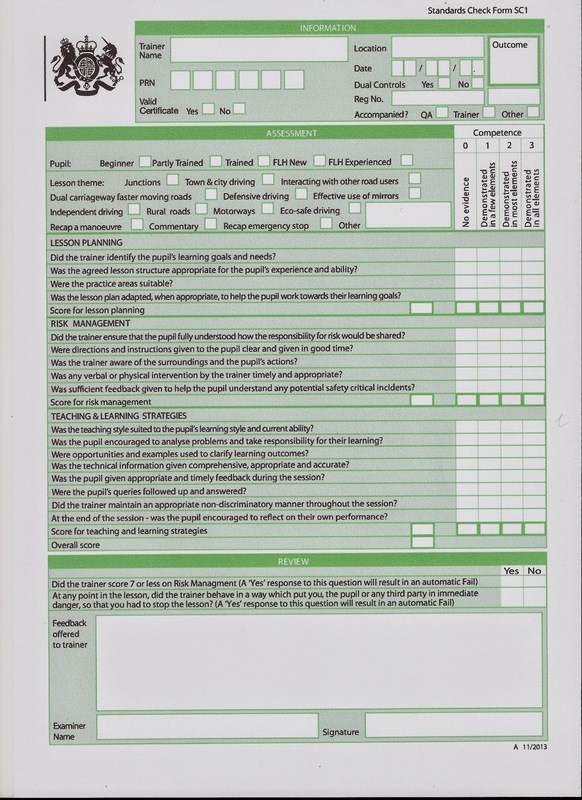 If I hire a tradesman I would need to understand the exams he took and the criteria for marking if the grade was to mean anything to me. If someone else recommends that person then I know they can do the job so I don't have to bother about the grade at all. Instructor grades will only have meaning inside the industry. If a school is looking to take an instructor on then they would be interested to know their grade. Some insurers offer a discount for grades 5 and 6. An instructor trainer should be of a high grade in the interests of credibility. When selling to the public, a friendly demeanor and a reputation for punctuality and reliability will do more to create new business than touting a top grade on the standards check. Where can I get driving lessons in Nottingham? How can I find a driving instructor in Nottingham? Do You Teach Intelligent Use of Driving Signals? The art of driver communication. I took a new pupil on the other day who is a university student. One part of his course work was the study of the use of signals by drivers to communicate with each other. This got me thinking about how we as driving instructors teach the use of signals. Do we produce thinking drivers who consider why they are signalling and for whose benefit, or do we simply train new drivers to use signals simply as part of a prescribed routine? Signalling is directly linked to forward planning and hazard awareness. Signals can only be effective if the information gathered by the driver is a relatively complete picture of the overall traffic situation. Based on this information a decision has to be made on which signal to give and when. All this needs to be done in a short time so it's quite a complicated task. I always explain to learners that the optional indicator signal when moving off and stopping creates a need to actually look properly along the road and take pedestrians into account. Simply giving a signal every time you move off to make sure you're covered negates the need for thorough observations. Signalling as part of a strict five point plan does not produce a thinking driver. The same occurs with multi lane roundabouts. Giving a signal every time when leaving a roundabout regardless of the lane markings is poor driving and can be misleading. 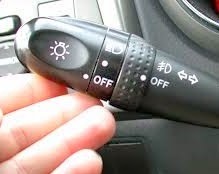 How many learners consider the brake lights as a legitimate signal as opposed to a by product of using the brake? Not many I think. Pressing the brake pedal lightly and early can give a warning to those behind before more pressure is applied to actually slow or stop the car. When reversing during manoeuvres I have had pupils who have learned with other instructors who constantly shift in and out of reverse gear. They never considered that this would result in turning the reversing lights on and off which can be confusing to other drivers who may be waiting to make their decision based on the signals being given. Many new drivers don't consider the use of signals with regard to pedestrians. If an indicator is not required because your lane is only going left, what about any pedestrians waiting too cross the road you are turning into? It would benefit them to know you are turning as they probably cannot see the road markings or wouldn't take notice of them if they were visible. We need to teach signals as a complete method of communication with other motorists and pedestrians. What about arm signals? I think I have seen them being used twice by older drivers in the 12 years I've been teaching. Most drivers couldn't demonstrate them or wouldn't know what they meant if they saw someone giving them. This is perhaps an area where my teaching could be improved as I only pay lip service to them and hardly ever practice using them in a real situation. Are arm signals a thing of the past? If nobody know what they mean then they are no use at all. Teaching the effective use of signals as part of a communications package means first teaching about awareness and decision making. It's also about considering the needs of other drivers and the safety of all road users. Sound use of signals is therefore evidence of a competent and thinking driver. It's good to do some advanced driver training now and again. 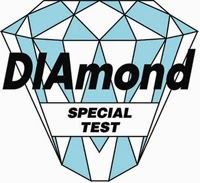 Today was made all the more interesting when I had a session training an ADI to take the Diamond Special Test. Good to see a man taking up the challenge and developing his skills. I had a couple of hours with Scott who is a driving instructor, ORDIT instructor trainer and fleet registered trainer with BSM. Having already passed advanced tests with the Institute of Advanced Motorists and RoSPA, Scott had a good deal of knowledge and a high standard of driving. There's always room for a fresh pair of eyes that can help to fine tune anyone's driving style and make it even more safe, smooth and efficient. After a pleasant introduction we set off. We headed out on the major roads and roundabouts bound for the motorway. I found that Scott tended to cancel his signal just a little bit too early when leaving roundabouts and changing lanes. Only a fraction too early and the average motorist might not even notice. I find it best to fully complete any manoeuvre that involves changing direction before cancelling the signal so to completely cut down any margin for doubt in other drivers as to your intentions. More often than not I find the auto cancel feature on the indicators works at exactly the right time and the only reason to cancel manually is if the wheel is not fully straightened after the manoeuvre. I found that Scott was not exactly eco-driving when it came to gear changes. Staying in third gear and accelerating up to nearly 50mph then shifting straight to fifth causes excessive revving of the engine and greater use of fuel. Scott told me this is the RoSPA approach, to gain more progress by missing gears changing up. We tried it going through fourth gear when building up speed and found hardly any progress was lost but the engine sounded smoother as the rev count was lower. I'm all for eco-driving and would only miss a gear if I was accelerating on a steep downward slope, missing fourth in this case helps keep engine speed down as gravity helps you to speed up. Scott's commentary drive was absolutely superb. I learned a lot from listening to him as we negotiated Stapleford town centre. Packed full of detail and highlighting some excellent forward planning, it was a pleasure to sit and listen. I must brush up on my commentary drive. It's something I've perhaps neglected lately and it's such a powerful tool to develop hazard awareness. Manoeuvres were sound with just a couple of slight adjustments to the left hand reverse and the bay park. I'm sure Scott will do well on the Diamond Special Test. Passing it will mean he has completed the big three when it comes to advanced driving. That's good to see. Are You Seated Comfortably When Driving? 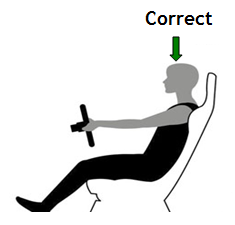 Here's one all about the correct seating position when driving. Second nature to some drivers but sadly not for others who continue to drive in a poor position. It only leads to aches and pains, fatigue on long drives and makes for poor use of the controls. A lot of the time it can be caused by nervousness and tension when behind the wheel so relax and take it all in your stride. Comfortable driving lessons in Nottingham. Now I'm an Independent Driving Instructor! Today was my first day as an independent driving instructor in Nottingham. 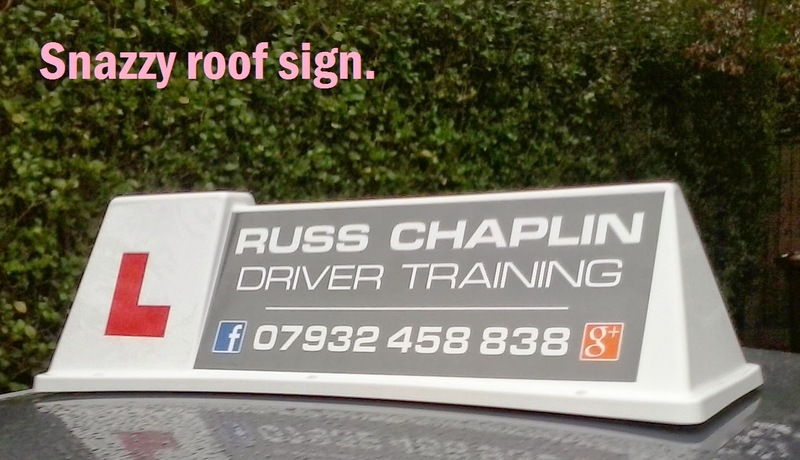 For 12 years now I have been working as a franchisee at a couple of different Nottingham driving schools. Time to take the plunge and not just look at other independents wondering "how do they get their work?" In actual fact I have found in the last couple of years a franchise does not provide enough work to fill my diary as I would like week in week out. I think those days are gone forever. In times past it was the Yellow Pages that was the big deal. Everybody used it to find everything. It would cost a few thousand pounds for a decent advert which would bring in a lot of work. In this case it was worth being franchised as the fee would be what you would have to spend on advertising anyway. Plus you're getting the phone answered for you. For years mt diary was packed full and I never had to worry or think about my own advertising. My, how things have changed. Now with social media marketing and a million online directories (most of them useless) there are so many ways for the little guy to compete and get his own work. It's no big effort to make a Facebook business page which doesn't do anything unless you put money into sponsored posts or competitions. You can spend a lot of time getting more likes before you realise that likes are not paying customers. It gets the odd lead now and then but people just seem to be shopping by price. There's Twitter which is good for being hacked or trolled, as is my experience. And then there's Google search engine rankings. Which is where the money is. I love a bit of search engine optimization me. I'll tinker with my website til the cows come home and it looks like the work is paying off with enough leads to keep me busy. I've just got to keep it up now so I can get established under my own name. I'm not convinced about how much a fully liveried vehicle counts. Does it bring in a lot more work or is the more subtle approach of the roof box and magnetic panels just as effective? You would be hard pressed to make an Audi look bad but I know of one national driving school who have achieved just that. Yep, you know who I mean. It's good for a school to have liveried vehicles I suppose. It helps to build a recognizable brand identity but does the solo instructor really need lettering all over the car? I'm not sure.